The early 1980s were the best of times, the worst of times to be a nerd. On one hand, pop culture was riddled with now-classic genre films. Flicks like Blade Runner, Tron, The Thing, E.T., Poltergeist and Conan the Barbarian filled movie theaters in 1982 alone. The video game industry had exploded to the point where there were cartoons and sugary cereals based on arcade characters. Heck, even a brainy band like Devo could break into the Top 20. On the other hand, this was the era in which nerds became a caricature — a buttoned-up bundle of pocket protectors, tape-covered spectacles, hiked-up slacks and Brylcreemed hair. In the mind of the general public, or at least the athletic dudes at school, if you read The Lord of the Rings, you probably looked like Ed Grimley. The entire Revenge of the Nerds movie franchise was built upon this stereotype. And then, in December 1986, William Shatner had to appear on Saturday Night Live and set back geek/jock relations by decades. Wearing a pair of Spock ears, Jon Lovitz shows off a recently purchased Star Trek cast photo to Dana Carvey, who sports a "I Grok Spock" T-shirt. The two Trekkies are in the crowded ballroom of a Holiday Inn for the 16th Annual Star Trek Convention. By now, you know the rest. The "Trekkies" skit is comedy legend. Shatner steps up to the podium and tells devoted fans of Gene Roddenberry's creation to "Get a life!" The phrase became so attached to the Star Trek universe that Shatner would release a book about Trek fandom titled Get A Life! in 1999. Thanks in large part to this SNL sketch, "Trekkie" became a derogatory term. It stigmatized fandom to point where "Trek" was a four-letter word to those who were casual fans of science fiction, i.e. Star Wars lovers. It was a difference akin to being a Dungeons & Dragons dungeon master versus watching some He-Man once in a while. 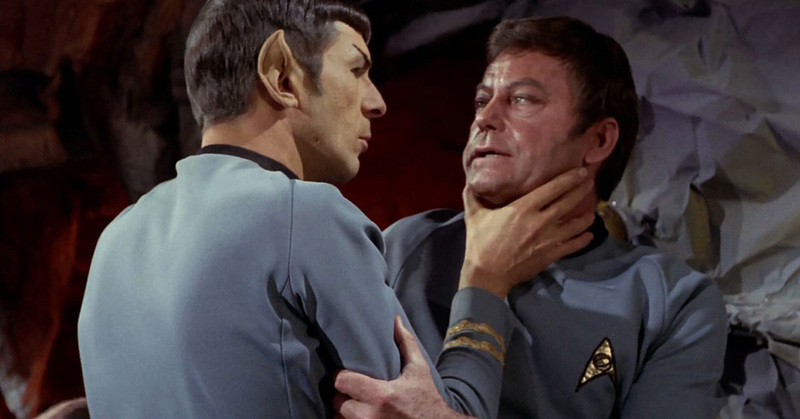 "Trekkie" grew to become such a pejorative that it gave birth to a new term, "Trekker." We are here today, on the 50th anniversary of Star Trek, to say it is time to put aside such petty differences. It is time to bring "Trekkie" into the light. Here is a scenario that happens quite frequently on talk shows, whenever an actress such as Mila Kunis or Megan Fox show up to promote a new movie like Jupiter Ascending or Teenage Mutant Ninja Turtles: Out of the Shadows. "I'm such a nerd!" they will say. As evidence, they will offer up their experience playing Halo or waiting in line for hours to see a Star Wars movie. You know, two of the most popular things in entertainment. Pop culture is nerd culture — or vice versa. If you hop on a United flight right now, you will have the option of watching Captain America: Civil War, Batman v Superman: Dawn of Justice or X-Men: Apocalypse. Meanwhile, there are no fewer than 51 upcoming TV shows based on comic books. Sixty percent of American homes regularly play video games. And the age of the average gamer? 38. There are more women over 18 playing video games than boys under the age of 18. Many of these same people — gasp! — enjoy football. Because when you make a Venn diagram of two of the most popular things in the world, there is going to be some overlap. In other words, the nerd vs. jock war has long been over. If there ever was shame in publicly admitting deep Star Trek fandom, it certainly does not exist now. Not when the third Star Trek reboot blockbuster is still playing in theaters. So if you enjoy Star Trek enough to own some DVDs, a Spock Funko POP vinyl figure, a Hallmark Christmas ornament or an Enterprise pizza cutter, you are a Trekkie. Star Trek is mainstream, not a badge of nerd-dom. There is no difference between Trekkie and Trekker. But you know what is nerdy? Arguing about semantics.